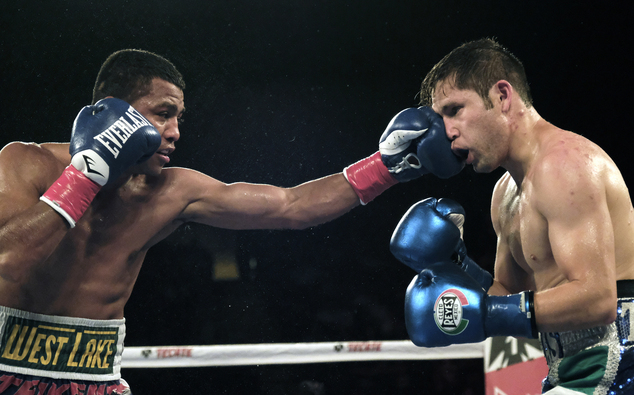 Roman “Chocolatitio” Gonzalez fighting underneath a Gennady Golovkin main event has become a regular thing of late. It has been the case in three of their past four respective championship bouts. They’ll do it again when Gonzalez defends his super flyweight world title against Srisaket Sor Rungvisai of Thailand on March 18 at Madison Square Garden, where that night middleweight champion Golovkin (36-0, 33 KOs) will take on Daniel Jacobs (32-1, 29 KOs) in the main event (on HBO pay-per-view). Gonzalez (46-0, 38 KOs), of Nicaragua, believes Rungvisai is capable of giving him some grief in the ring. Gonzalez in September became the first from his country to win titles in four weight classes when he took a unanimous decision over then-super flyweight champion Cuadras at the Fabulous Forum. Cuadras in May 2014 took the title from Rungvisai via eight-round technical decision in Cuadras’ native Mexico. That’s the same belt Gonzalez took from Cuadras, and Rungvisai (41-4-1, 38 KOs) wants it back. “I respect Roman Gonzalez,” he said. “He is a legend. He has done great things for boxing, especially by showing the world how talented and exciting smaller-weight fighters can be. I am happy for Nicaragua to have such a great hero.